I am fascinated by the precision in the language — foolish consistency … little minds … and hobgoblins that are adored? 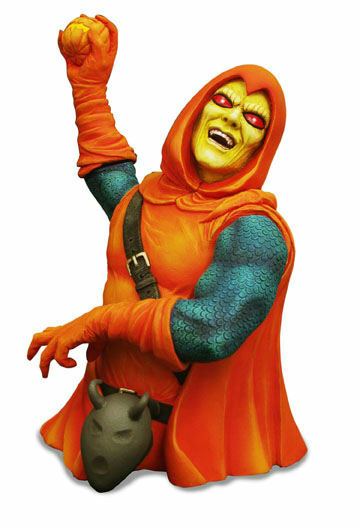 I admit I’m a little scared of that hobgoblin guy. So, first up, we’re not talking about simply being consistent. We are all incredibly consistent when we approach a traffic light — we keep going if it’s green, we stop if it’s red, and we go faster slow down if it’s yellow … This kind of consistency is most definitely not foolish; it is a very good thing, no? 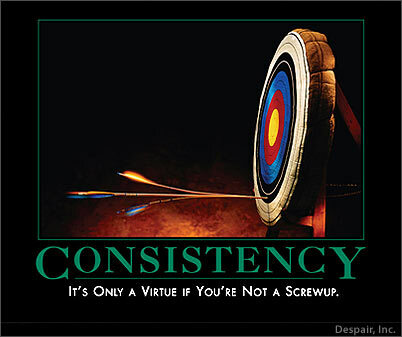 Most consistency is good! It establishes routines that frees our minds up to think of other, more important, more complicated things. So when is consistency foolish? When it is apparent that by placing consistency as primary we exhibit a lack of good sense or judgment; we do things that are unwise; we are seen as stubborn. Do you think this sort of thing happens at work? If you do, let’s hear from you; if you don’t, I really want to hear where you work! In fact, being consistent is its own explanation. Being consistent requires no change. Or, more apt, no adaptation. To be inconsistent is different, and requires an explanation; you need to have a rationale, and that leaves you susceptible to challenge… Sounds like work. And a little bit threatening. It’s easier to be consistent. Easier is not only foolish, it is dangerous. When we are foolishly consistent, there’s no learning, no growing, no stretch. Sticking to what is known, safe, and easy cuts off the flow of progress through fresh ideas and differing viewpoints. There is atrophy. We eventually become unable to reason, to analyze, to be logical. … to hobgoblins! The foolish consistency becomes monstrous. It takes over. We no longer think for ourselves. We cede our thinking to past practice, to orthodoxy. … adored by little statesmen and philosophers and divines. Yowsa. That’s strong sentiment right there. That’s scary. He had me at foolish. Consistency at work…. the first thing that pops into my mind is that explains a lot about government offices! Seriously, this made me think of performance management. It is easier to be like Grandma and spread the praise, promotions and raises like peanut butter instead of be inconsistent with those tools. The conversations that have to ensue because of inconsistency are difficult and require more effort. I love the perspective – thanks and keep it coming consistently twice a week! Yeppir Danielle! Very much tracking with ya! I almost put a performance management example right into the post, but thought I’d leave the business example space wide open for y’all to fill it … Thanks for filling it! The fact that “foolish” describes a kind of consistency implies there are other kinds of consistencies, even some that are “wise” consistencies. There is certainly value in remembering the past as anyone in business (or in life) for long knows history often repeats itself. How often do we recognize there are few new mistakes, just old ones that time (or attrition) has allowed to be forgotten. Being a logic minded process geek, I find comfort and success in building consistency in my operational environment. But it has to be feed and kept fresh. Embrace change and find the freshness it brings. As Danielle noted, how stale is the air in Governemnt offices? How many times in the past month have we heard a statement like “That’s not how it works in Washington ! Why not? Lots of Hot, stale air there I think. Hobgoblin breeding grounds most likely. Right on Darryl … great thoughts here … I recall a quote, not sure from where, “It is the doom of men that they forget.” … consistent with your first paragraph! Your color in your second paragraph is perfect. Perfect! Love it! And Washington as hobgoblin breeding grounds is funny and sad all at the same time! Ha!